Supremus Group has different HIPAA compliance forms and templates (download only) to help you get HIPAA compliant and jumps start your HIPAA compliance projects. Below you will find all the HIPAA compliance tools which will help your organization with your HIPAA compliance project requirements and save you lot of time of your team and thousands of dollars. All templates are in MS Word format and guides and samples for reference are in PDF format. Full suite is email to you after the purchase. Our compliance templates are the most comprehensive and update to ensure you meet the compliance requires the FIRST time. We encourage your HIPAA Privacy and Security Compliance Officer to take our compliance training Certified HIPAA Privacy Security Expert (CHPSE). This will give you the knowledge to implement these policies. The final HIPAA Security rule published on February 20, 2003, requires that healthcare organizations create policies and procedures to apply the security requirements of the law – and then train their employees on the use of these policies and procedures in their day-to-day jobs. We have developed 71 HIPAA security policies which include 60 security policies & procedures required by HIPAA Security regulation and additional 11 policies, checklist and forms as supplemental documents to the required policies. These policies meet the challenges of creating enterprise-wide security policies. The suite addresses all major components of the HIPAA Security Rule and each policy can be adopted or customized based on your organization’s needs. Risk Analysis is often regarded as the first step towards HIPAA compliance. Risk analysis is a required implementation specification under the Security Management Process standard of the Administrative Safeguards portion of the HIPAA Security Rule as per Section 164.308(a)(1). Covered entities will benefit from an effective Risk Analysis and Risk Management program beyond just being HIPAA compliant. Compliance with HIPAA is not optional… it is mandatory, to avoid penalties. 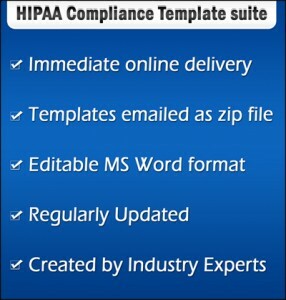 Our HIPAA compliance suite for privacy and security templates come in Microsoft Word/excel files so you can add, change and delete content as required to complete your compliance forms. If you have any questions, or if you wish to see additional samples, please feel free to contact us at Bob@training-hipaa.net or call on (515) 865-4591. 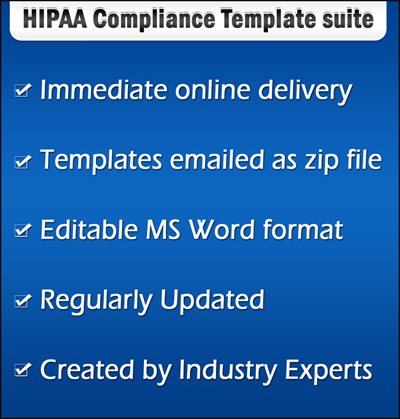 You can also buy individual HIPAA template suites, which are available in our online HIPAA store for purchase.